JuanaMikels.com: Free Ebook Available Now for Everyone on 31 Days to a Better Marriage! Free Ebook Available Now for Everyone on 31 Days to a Better Marriage! 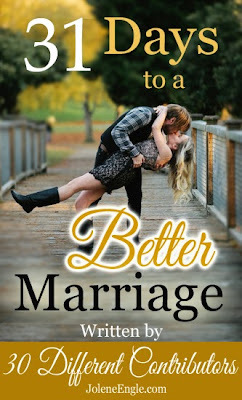 Get your free Ebook today to view on your computer, iPad, iPhone, Smartphone, or other tablet to read all 31 different entries in 31 Days to a Better Marriage. The blog contributors were all Christians, and ranged from younger wives to older wives (like me!). I was so honored to be a co-contributor with these godly women. Today is All Saints Day, a wonderful day to reflect on who has encouraged you to follow Christ. It's also a great time for you to receive this wonderful free gift from the heart of thirty Christian women. I wrote on day 30 on Taking Up of the Cross in Your Marriage (giving up the right to one's self and preferences. Ouch!) To get the whole series, click on the picture, then click download & direct download, or go here and click download, then direct download. Give it a minute or two to load, then you should see the book cover, followed by the entire 79-page book. A huge thank you, to Jolene Engle for compiling, co-contributing, and coordinating the whole project! Thank you for joining me, Juana! It was such a privilege to be party of it, Jolene! May it yield much lasting fruit for many!